Swifts are small birds ranging from 5-25 cm. They are in the order Apodiformes, suborder Apodi and family Apodidae (Animal Diversity Web). Apodidae means “without feet”. They are named this because of their very small feet. Their small feet do not allow them to perch so they are often seen in flight. They are able to cling to vertical surfaces like cave walls or dead, hanging palm fronds. 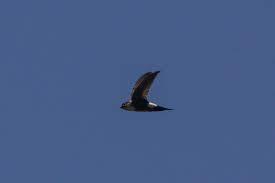 Swifts also have a crescent shaped tail feather that aids in high speed flight. In fact, the swift is said to be the fastest flying bird flying under its own power. (BBC Earth News) They are found all over the world except in Antarctica (Animal Diversity Web). The Antillean Palm Swift (Tachornis phoenicobia) is endemic to Cuba, Hispaniola, and Jamaica (Gotelli and Abele)(Faaborg). There have been occasionally, although rarely, found in Florida, United States; Puerto Rico and other Greater Antilles islands (IUCN Red List) (Johnson). There are two sub species of T. phoenicoboia: T. phoenicobia iradii (the larger subspecies) and T. phoenicobia phoenicobia (Bond). The only know difference between these subspecies seems to be size, and there is other little information about them. T. phoenicobia is the smallest swift found in the Greater Antilles. It is 9-11.5 cm in length and weighs an average of only 9.2-11 grams (Chantler and Kirwan). Both male and female look alike and have similar size, shape and markings. The Antillean palm swift is a black bird with white marking on its rump, and on its underside on the belly and a black band across the throat (Bond)(Avise). The offspring have the same markings as the adult, but the contrast between them is much less obvious (Howell). They have a distinct forked tail but less deeply than other species of Tachornis. The call of the Antillean Palm swift is “a constantly emitted, faint high pitched twitter” (Raffaele) or “noisy, emitting a constant weak, twittering tooee-tooee” (Chantler). All sources tend to mention that its call is rather weak. The Antillean Palm Swift is a very common bird in the Greater Antilles, although, there actual population has not been estimated. They are common enough, however, that they are listed as LC (Least Concern) by the IUCN Red List (IUCN Red List). They are common in woodland areas, palms, sugar cane plantations, and even in urban areas (Raffale)(Lack). Typically, they tend to fly with a flock of their own. 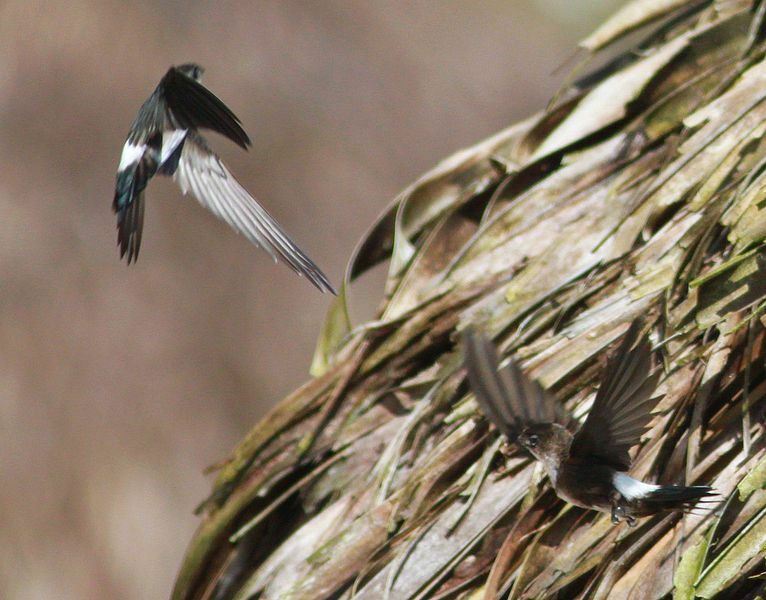 Although it not uncommon to see them with the swallows Caribbean Martin (Progne dominicensis) and Cave Swallow (Petrchelidon fulva) (Kepler). Customarily they tend to live in colonies of approximately thirty pairs (Olson). The Antillean Palm Swift are believed to be completely monogamous, but they have not been observed well enough to be conclusive (Damaj). Generally a clutch tends to be two to three eggs.The eggs produced are white in color. There are up to five eggs in a clutch (Raffaele et al.). Both parents rotate on and off incubating the eggs for three to four weeks. After the eggs hatch the hatchlings are then brooded by the mother. Raising of the chicks is done by both parents in the nest for about twenty to twenty eight days (Tristan)(Damaj). The population of the Antillean Palm swift never seems to be negatively impacted by habitat changes because of its ability to adapt. Adaptation to different environments has helped these birds when new human communities are constructed. Nests of T. phoenicobia hang from palms like sacks that have a cup In the bottom and a hole near the bottom that serves as a entryway. Although they typically build their nests on the underside of palms they are able to build them on other surfaces, too. In fact, it is not uncommon for the Antillean Palm swift to attach its nest to a thatched roof of a shed. (Johnson) In one instance a nest was found attached to a cave wall in a crevice (Kirwan). The nest is made up of feathers, dry grass and other vegetation that is held together with the bird’s saliva (Lack). The saliva becomes hard enough to adhere the construction materials to surfaces in order to hang the entire structure (including birds and eggs!) from the selected overhang. Decorative palm that are planted in human communities also provide great nesting places. The Antillean Palm swift does not have any known predators. With their adaptability, mobility and absence of predators the Antillean palm swift thrives throughout its natural range. There is possibly, though, of a population decline in Haiti following their recent earthquakes (Chantler at al.). Antillean Palm Swifts are insectivores. They feed mostly on flying insects caught in the air, but also scoop insects from the surface of the water. Most of their hunting is done under the cover of the tree canopies. Their consumption of insects provide humans with a very effective, natural form of pest control (Camfield). The Antillean Palm Swift does not migrate. It tends to only be found in the Greater Antilles (Tristan). Although there has been sightings outside this range, they are believed to be the cause of some other force. The finding in Florida is speculated to be because of a recent hurricane that may have put the bird off course (Howell). Vagrancy to Puerto Rico has been observed, but the habitat is not believed to be favored (Kirwan). Although the Anitllean Palm swift is a very common bird there is an absence of specific research on its habits and ecology. Whether or not these birds are territorial is not known. If they are territorial, it seems that their territories must be very small, indeed. There is no specific information on population size (Ekstrom). 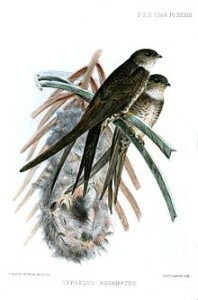 The life span of the Antillean Palm Swift is also unknown, and its first breeding age has not been determined. Although we know these birds are insectivores, there is no more detail of its diet (Damaj). Avise, John C. Antillean Palm Swift (Tachornis phoenicobia). Avise Birds. 13 December 2006. Web. 15 September 2015. Bond, James. 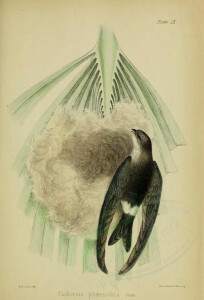 “Antillean Palm Swift (Tachornis Phoenicobia).” Field Guide to the Birds of the West Indies Princeton: Princeton University Press (1947): 122. Book. Bourton, Jody. Swifts Take Flight Speed Record.BBC News. 2015. Web. 3 November 2015. Camfield, Alaine. Apodidae. Animal Diversity Web. 2004. Web. 14 September 2015. Chantler, P. and G.M. Kirwan. Antillean Palm-swift (Tachornis phoenicobia). Handbook of the Birds of the World. 2015. Web. 16 September 2015. Chantler, Phil: Gerald Driessens. “Swifts.” Chantler, Phil. A Guide to Swifts and Treeswifts of the World. London: Pica Press, 2010. 201-202. Book. Ekstrom, J. and S. Butchart. Antillean Palm-swift (Tachornis phoenicobia). Bird Life International. 2014. Web. 15 September 2015. Johnson, Sibylle. Antillean Palm Swifts. Beauty of Birds. 2011. Web. 12 September 2015. Lack, David. “The First Primary in Swifts.” The Auk (1957): 385. Web. Latta, Steven and Christopher Rimmer. “Birds of the Dominican Republic and Haiti.” Princeton Field Guide (2006): 134. Web. Raffaele, Herbert A. and James W. Wiley. Wildlife of the Carriban. Princeton: Princeton University Press, 2014. Book. Raffale, Herbert. “Species Accounts and Color Plates.” Birds of the West Indes (2003): 106-107. Web. Tachornis phoenicobia. 2012. Bird Life International IUCN Redlist. Web. 20 September 2015. Tristan. Antillean Palm Swift. Freebase. 10 April 2007. Web. 5 September 2015. Faaborg, John. “Ecological Constraints on West Indian Bird Distributions.” Ornithological Monographs (1985): 640. Web. Graves, Gary R. “Historical Decline and probable extinction of the Jamaican Golden Swallow Tachycineta euchrysea euchrysea.” Bird Conservation International (2014): 245. Web. Gotelli, Nicholas J. and Lawrence G. Abele. “Statistical Distributions of West Indian Land Bird Families.” Journal of Biogeograhy (1982): 432. Web. Howell, Steve N.G. “Aerial Landbirds.” Rare Birds of North America (2014): 273-274. Web. Kepler, Cameron B. “First Puerto Rican Record of the Antillean Palm Swift.” The Wilson Bulletin (1971): 309-310. Web. Kirwan, Guy M., Robert S. R. Williams and Chris G. Bradshaw. “Antillean Palm Swift (Tachornis Phoenicobia) Nesting in sea caves in the dominican Republic.” (2002): 2. Web. Lack, David. “A Review of the Genera and Nesting Habits of Swifts.” The Auk (1956): 1-32. Web. Olson, Storrs L. “A New Species of Palm Swift (Tachornis: Apodidae) From the Pleistocene of Puerto Rico.” The Auk (1981): 230-235. Web. Bond, James “Derivation of the Antillean Avifauna.” Proceedings of the Academy of Natural Sciences of Philadelphia (1963): 87. Web.